Damaged and weakened hair needs protection and nutrition a lot more than your regular hair.. And we do mean a lot more. 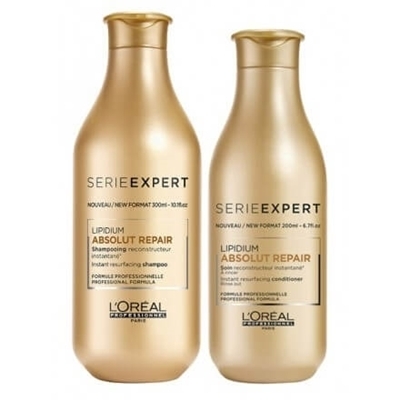 The best way to give your hair exactly what it needs is with L’Oreal Absolut Repair shampoo. A professional shampoo that leaves amateurs behind and allows only the most professional of cares. Lipids revitalize and regenerate even the most damaged hair, leaving hair powerful, radiant and magically silky. Just 10 minutes and all your hair problems will be a history. Just 10 minutes! Can you even imagine that? This fast working L’Oreal Absolut Repair conditioner almost instantly repairs your hair and makes it the beautiful mess it’s supposed to be. Includes a bunch of complexes that include lactic acid and phytokeratin, both of which strengthen the hair along the entire length, restoring the intercellular connections in the cortex of the hair.